Paper 8 1/2" x 14"
Four-color process printed on Side 1 of 12pt C1S Semi-Gloss stock. Coated with Aqueous Gloss. H3 business card slits on right pocket, with B1 brochure slit on left pocket. Colorado real estate company Team Lassen emphasizes its corporate colors to raise brand familiarity. Sweeping curved areas of color create motion and enthusiasm. A faded photo lets the audience imagine putting their own touches on the home. 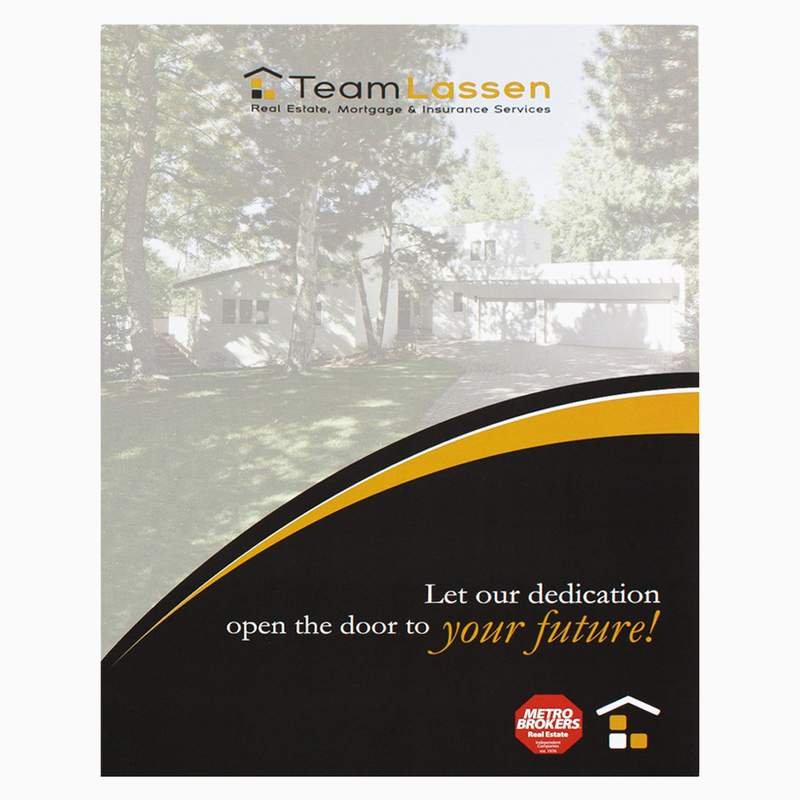 On the back, a corner curls up as if revealing a secret, that Team Lassen is the top real estate agency in Colorado. Four-color process printed on Side 1 of 18pt C1S White Semi-Gloss stock. Coated with Aqueous Satin. H1 business card slits on right pocket. 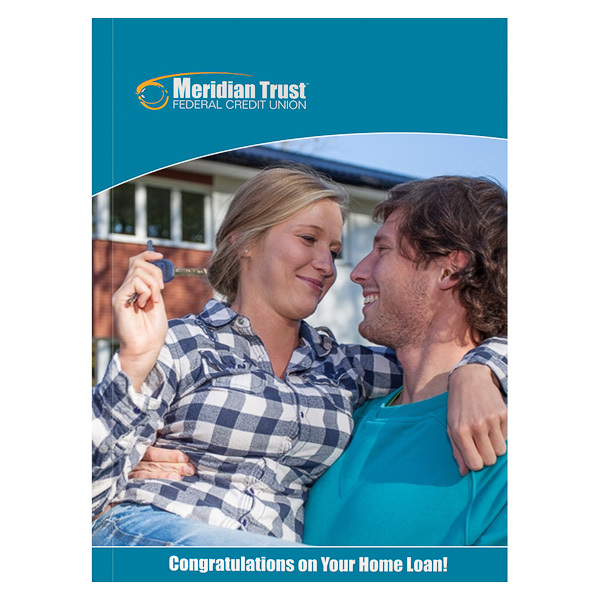 To help celebrate clients' new home loans, Meridian Trust Federal Credit Union features a photo of a couple at their new home. The man wears Meridian's trademark teal, the color of the design's panels and pockets. An orange logo adds a pop of color to the cover. Inside, the left pocket congratulates recipients and offers details about the credit union; the right pocket showcases its credentials and logo. Contact information appears on the back, beside a portion of the photo that carries over from the front cover. Law Offices of Peter T. Clark, P.C. 1 foil stamped area on Side 1 of uncoated 100lb Dark Blue Linen stock. H2 business card slits on left pocket, with H3 business card slits on right pocket. 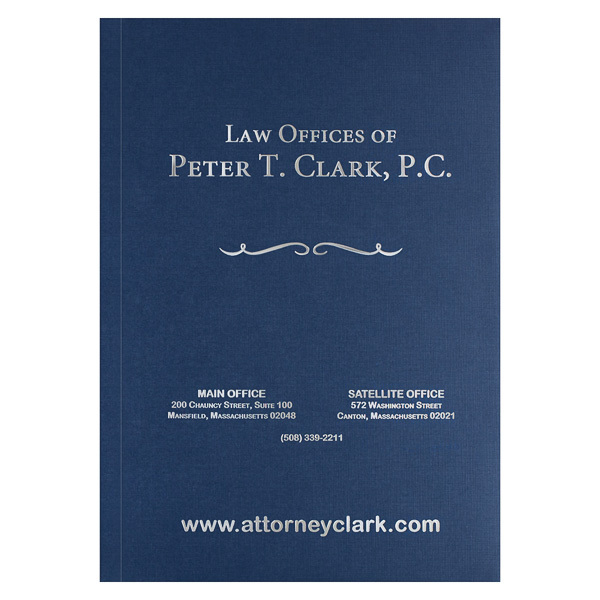 Classic navy blue panels lend an air of professionalism to the Law Offices of Peter T. Clark. The serif font is popular with law firms, as it looks traditional yet stylish. Platinum foil brightens the cover with a reflective element. To keep the metallic foil from overshadowing the design, text is grouped and spaced on the cover to create visual hierarchy. Contact information is located on the front to help clients reach their attorney in a hurry. Storing legal documents in one place is a breeze, thanks to this product's expandable pockets. Each pocket can hold up to 1/4" packets of 8 1/2" x 14" paper, while a 1/2" backbone accommodates their combined carrying capacity. 1" reinforced edges guard the panels against wear and tear. Add a design to the pockets and reinforced edges to create a cohesive look inside and out. Dimension Closed: 9 7/8" x 14 1/2"
Dimension Open: 20 1/4" x 14 1/2"